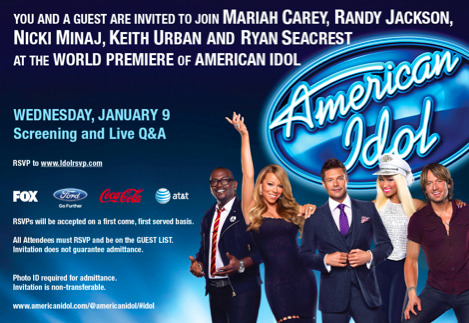 RSVP for a FREE American Idol Premiere at AMC Sugarloaf Mills! Want to watch the American Idol 2013 season premiere in style? FOX and Idol will be hosting huge parties across the country to celebrate the launch of Season 12 on January 16th and 17th. But here’s the kicker: you won’t have to wait until the 16th to see the premiere episode! These parties will be held on January 9th, one week ahead of the premiere, to help spark excitement and get the word out on what to expect. On top of all that you’ll have a chance to ask a question live to the new judges panel including Mariah Carey, Keith Urban, Nicki Minaj, and Randy Jackson. Stick around after the premiere viewing for your chance to talk with the American Idol 2013 judges. It won’t cost anything to attend the parties, but you do have to RSVP in advance and they’ll be checking IDs to match names against the list. The free premiere event will be held at 7:00 PM, at AMC Discover Mills, 5900 Sugarloaf Parkway, Lawrenceville, GA 30043 with the LIVE Q&A starting at 8:30 PM. Doors open at 6:00 PM and all seating is free and first-come, first-served.